As the summer draws to an end, I thought this would be the perfect time to share this information. Next summer, you will be fully prepared. 1. Do not show up empty-handed. There are so many things that you can bring and it doesn’t have to be food. You can bring silverware, napkins, or cups. It’s not fair to indulge in the festivities when you didn’t contribute. And whatever you decide to bring, please make sure it is an adequate amount. 2. Do not bring additional guests. If you do not have permission from the host/hostess, do not bring additional guests. If you do happen to obtain permission to bring an extra body, make sure they do not come empty-handed. That is an additional mouth to feed; they should contribute as well. 3. Ask if your assistance is needed before the food is served. The host/hostess was nice enough to open their home to you. The least you can do is offer a hand. They may need your help in setting the table or bringing out the food. Now, your gesture may be turned down, but it’s the action that counts. You do not have a maid. Well, you may, but I’m sure they’re not in attendance. With that said, clean-up after yourself. Throw away your plates and cup. Don’t allow the host/hostess to come behind you to clean-up something that you are perfectly capable of taking care of. 5. Ask if you can help clean-up. This is very similar to number three, but your help may actually be needed. There’s nothing like cleaning up after a gathering by yourself. You could offer to take the trash out or wash dishes. The host/hostess may take you up on this offer, so be prepared. This is the most important gesture you can give the host/hostess. A simple “Thank you” can go a long way. It can really be disheartening to someone who was not shown gratitude for all their hard work and preparation. This may cause them to reconsider having potlucks/bring a dish parties at their home in the future. 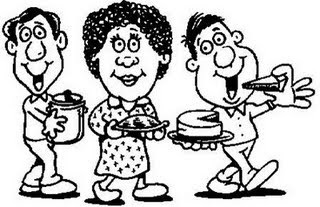 If you have additional points about Potluck/Bring a Dish Party Etiquette, please feel free to share!